So, has anyone gotten the impression that I hate cleaning the kitchen? Well, that’s just wrong! I like cleaning the kitchen. I hate doing the dishes. It’s never ending. It’s one of the most futile jobs ever. As soon as they’re all done, they get dirty again. During one of the few times in my life when I was living by myself, I actually would get fast food on purpose to keep from dirtying up plates. That fact that it tasted good was beside the point. Over the years, I’ve learned some things that are still surprising to me. For instance, salt is a great cleaner. Remember in the last post, I talked about cleaning cast iron with salt and a paper towel? Well, another trick with salt that my mother taught me is just as effective. How many times have you burned stuff in a pan? You try soaking the pan with hot water and dish soap, but the gunk doesn’t come out. Steel wool, scraping forks, dynamite, nothing seems to work. Mom told me to put enough water in the pan to cover the burned gunk by half an inch then pour table salt over the burn. Put it on heat, let the water come to a boil slowly, and the gunk will lift right off. If I was Alton Brown, I’d give you some kind of scientific explanation about the salt and water combining into some low-grade sulfuric acid and eating through the gunk compounded to the surface of the pot, but I’m not. It does work. I’ve seen it happen, time after time. Another cleaning tip from my mom, but one that’s been verified time after time in every single “old wives tales” kind of cookbook is vinegar and water. When I’m cleaning grease from the stove or oven or countertops or wherever else it collects, including the floor, I want the easiest thing I can find to get it out of there. I typically go to spray chemicals, you know which ones. But in the past, and likely into the future, I’ve used solutions of vinegar and water of various strengths. Put equal portions into an empty spray bottle, give a couple of squirts, and it cuts through anything. You need a little more elbow grease, but it works like a champ. It also works on windows and mirrors. If you use newspaper, it leaves no streaks of any kind. Again, there’s a scientific explanation, but I’ll leave it to Alton Brown. Yesterday, I gave the garden and the plants a “dry” day. I do that once a week so they will act like they do “in the wild.” Since the ground was dry, I decided to look in on the tomatoes to see what was happening. I had a bunch of cherry tomatoes hiding in the dirt that I wanted to look at. Turns out, all the cherry tomatoes were ready to be picked. I had three dozen of them, or thereabouts. Then, just to see, I started looking around in the goliaths. Imagine my delight when I was able to pick a dozen of those guys. All of them perfectly red, and perfectly delicious. I gave half of them to my sister, who had a handful of her own from the seedlings that I gave her so many weeks ago. FiL and I had several for lunch. Then last night, for dinner, I had one of the goliaths chopped up with some mozzarella cheese, fresh basil, sunflower seeds, chopped scallions, and oil and vinegar. Yumm!!! The best part is there are still a TON of green tomatoes left on the vine and more coming. I’ve about given up on the beans; the sun is just too much for them. The carrots are coming along and I’m going to harvest all of them this weekend. 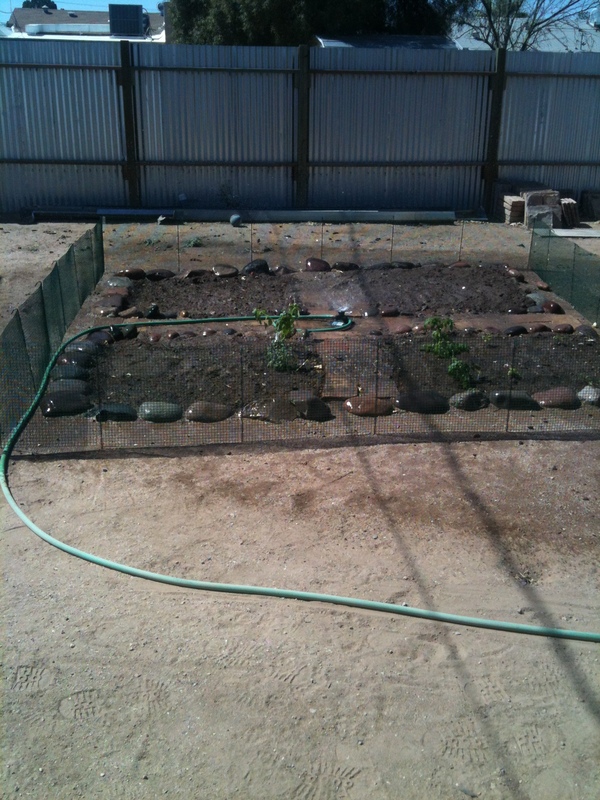 The peppers are doing what they do, and the herbs are looking good. I used the last of the cilantro last weekend, so I’m experimenting with the parts I didn’t cut off, keeping them watered to see what will happen. I’ve got a non-producing squash plant that I’m about to cut up. It’s pretty and huge, etc. But no zucchini. I’ve decided next year, I’m going to move the garden to a section of the yard that gets shade for several hours and is protected from the afternoon sun. That will help the plants that get burned so much. So, who’s been watching the Paula Deen saga play out? For any who are visiting from another planet, Paula Deen and her brother, Bubba Hiers, own a restaurant Georgia. One of their employees charged them with creating a hazardous work environment, as well as using racial and sexual slurs. In dealing with the law suit, Ms. Deen gave a deposition and that deposition became public. I was a little skeptical at first, since the story was broken by The National Enquirer. But as each day went by, more accusations arose and finally Ms. Deen gave a public apology. But it didn’t end there. Major sponsors dropped her like the proverbial hot potato. More employees came forward with more information. Her background and history were dissected, and suddenly it was divided along racial lines. It’s still early days, and whether or not she and her brother win or lose the law suit(s), she will never be the same icon she was before this mess occurred. I read this analysis recently, and it made sense. Paula Deen became known as the Queen of Southern Cooking. But in building her brand and empire, she ignored what many considered to be the real traditions of southern cooking. She laid claim to the results of generations of tradition without giving due credit to those who had actually created the traditions. It’s an interesting theory, and it helps explain the speed of the downfall. Anyone else think something different? This weekend is supposed to be one of the hottest in recorded history. Please be careful, drink plenty of water, and watch your pets closely! BTW – I LOVE chocolate cake. UPDATE: I went out to the garden just a bit ago pondering where to cut the squash vine to get rid of it and found three HUGE squashes! Don’t know what kind yet. I’ll let you know when I figure it out. Post # 133 KP Duty, Again! Okay, so here’s the post that I was going to do last time, but didn’t. And btw, the problem hasn’t disappeared. It’s just changed. First, though, let me give out a great big YIPPEE! for the Supreme Court rulings today. Okay, on to the real blog. We all have things in the kitchen we don’t like doing and apparently mine is doing dishes. I’m lucky because about 98% of my stuff goes into the dishwasher and is no real hassle. BUT as you may recall from past posts, I have a few items that can’t be blithely stuffed into a machine shooting jets of scalding water and soap around. In most kitchens, these items are: wood, cast iron, and silver. In mine, it’s just wood and cast iron. I do have a precious metal, but I’ll talk about that at the end. Silver/Precious metals: Most silver and gold utensils now are electroplated and not solid. However, all silver and most precious metals will oxidize over time. Oxidize is just a fancy name for rust. Rust is that ugly powdery stuff that occurs when metal is broken down by water and oxygen. The one most people are familiar with is the orange one on iron, but all metals will oxidize over time if not treated properly. With silver and other precious metals, it’s easy to take care of. Wash the item gently with warm water and gentle soap until it’s clean. Rinse thoroughly, then towel dry completely. Some people polish the silver once a week, some once a month. It really doesn’t matter if the item is stored, but if it’s on display, it needs to be polished as often as it tarnishes. There are lots of different ways to polish silver, but the tried and true method is using a reputable silver polish. Never apply to the item. Put a little on the rag, and start wiping. It’s going to take some elbow grease and time, but soon the item will sparkle like new. There are other ways, “old wives tales” about using baking soda, or aluminum foil, but that will leave scratches and mar the surface. We also have a ton of wood furniture and antiques. Wood takes special care in the kitchen. Like silver, it must be washed by hand and dried thoroughly. However, wood reacts to water. Many people think you buy wood for the kitchen and plan on throwing it away after some time. You don’t have to. One way wood reacts to water is to swell. The fibers get wet, they swell, but they don’t always swell uniformly. Eventually, the wood feels a little soft and fuzzy. Simply sand it lightly with a fine grit sandpaper and let it dry. Eventually it will get seasoned and stop swelling. Once in a while, you may need to oil your utensils. Always use a food grade mineral oil. Never ever use vegetable oil of any kind. Never. I can’t stress it enough. Don’t do it. Am I getting through? Do you understand? Never! Vegetable oil will spoil and go rancid. If that happens, throw it away or use it in the fireplace. That includes olive oil. Some people say olive oil won’t spoil, but it does. Two tips: If you’re making salad in a wood bowl, cut a clove of garlic in half and rub the bowl. It will pick up the flavor of the garlic and lightly transfer it to the salad. If your cutting board has got so many gouges it can’t be used, take it to a wood shop and have it sanded smooth, or do it yourself. Once it’s sanded, rub it down with a food grade mineral oil and you have a new cutting board. 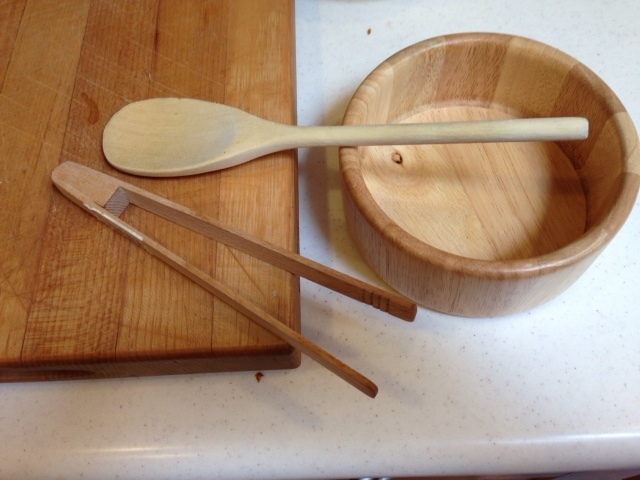 Never let your wood utensils soak in water. They can warp and be destroyed. Cast Iron: This is one of my favorite materials. It’s been used for hundreds of years and soaks up and transmits heat effectively and evenly throughout its surfaces. It holds heat longer than most other materials, too. It cooks evenly, cleanly, and wonderfully. My mom had a cast iron skillet that was huge and had a matching lid. Most of the time, she fried chicken in it, and it made the best fried chicken you ever had. I don’t know what happened to it, but I think one of my brother’s wives inherited it. (If any of them are reading this and don’t want that skillet/lid anymore, I’ll be happy to take it off your hands.) We have several pans and griddles, as well as a few pots and specialty shaped pans. Cast iron will last for lifetimes if treated properly. And treating it properly is ridiculously easy. The first thing to remember is never use soap on it. The second thing to remember is when using water on it, dry it completely (not using direct heat) to avoid that whole rust thing. Once the piece is dried, protect it from rust over the long term by spreading a thin layer of oil over its entire surface. What I do is put a tablespoon of vegetable oil on it and use a paper towel to rub the oil into the metal. Periodically, you’ll want to “season” your cast iron implements. This is easy. Spread oil over all surfaces and place in a cold oven face down. Line your oven with aluminum foil to catch drips. Turn your oven on its highest setting and allow it to heat up with the cast iron inside. Bake the cast iron for fifteen to twenty minutes, then turn the oven off. Allow the cast iron to cool down COMPLETELY before handling. This will help build up the black patina that allows cooking without food sticking. 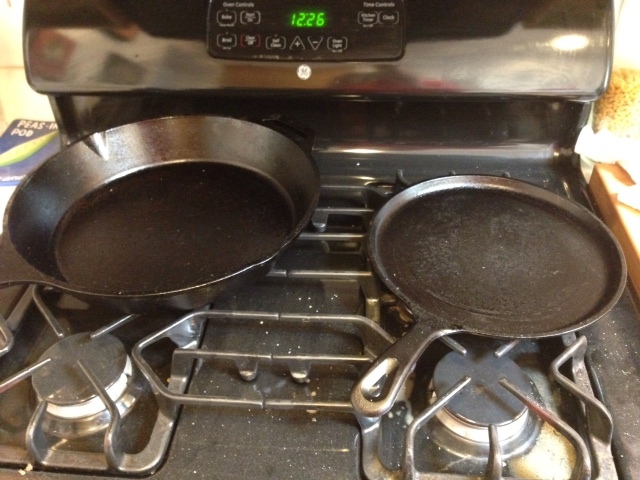 An alternative to cleaning cast iron without water is to wait for the cast iron to cool down to warm to the touch. Pour a half cup of regular table salt into it and use several paper towels to scrub it out without water. Once all the food residue has been loosened and easy to remove, use more paper towels to wipe the salt and residue into the trash. Dry steel wool will also accomplish the same thing. Just make certain you’re using steel wool that doesn’t have soap in it. Hope you enjoyed this foray into KP. One more post of this, and I’ll move on to other topics. Enjoy!! For those who haven’t been in the military, or raised by parents in the military, or exposed to military life through television or the movies, KP stands for Kitchen Patrol. It entails cooking and cleaning. I’ve been on KP for as long as I can remember. When I was tall enough to reach the sink, I was drying the dishes that my older sister was washing. That was our chore in the household. We both hated it. Somehow, over time, she was left out of the equation and I was doing dishes by myself. And that evolved into cleaning the whole kitchen. Of all the household tasks, doing dishes is the one I hate most. People have tried to talk me out of hating it, but it never works. One woman said she liked how clean her nails were when she was done. Another person talked about how his kitchen sparkled when it was clean, and how there was room to cook complicated meals when all the counter tops were empty. To me, it was just an exercise in futility since the dishes were just going to get dirty again. My dad, like clockwork, would always get something to eat exactly thirty minutes after I’d cleaned the kitchen. EVERY NIGHT! And it wouldn’t be just a simple bowl of ice cream. He’d mess up at least three plates, a bowl, a glass, and enough cutlery for the entire family to fix whatever he was going to have. I could count on having to clean things up twice every night. I tried waiting until he was done with his second feeding, but he would hold off, thinking he’d be getting in my way until I had to get the kitchen clean because I had other things to do. Then his countdown timer went into action, and thirty minutes later . . . . When I was on my own, it got a little better. But it was still harsh looking at the clean dishes knowing that in a few hours, they were going to be dirty again. I started using paper plates and plastic utensils since they were throw away, but I found myself rinsing off the plastic utensils and looking for bargains on plastic formed plates so I could reuse them, so I gave up. Of course, now I have a more philosophical attitude about it. It’s one of those jobs that has to get done so I do it. My family would love to help me, and offer constantly, but I nearly always turn them down. It was hard to explain until a recent incident. I had run a load of dishes in the dishwasher. (A wonderful device, by the way, and I haven’t been without one in decades.) I typically load and run the dishwasher in the evening and I set it on the heaviest duty cycle possible to make sure the dishes get clean with no residue. So it takes a couple of hours to run. I’m usually either writing or in bed by the time it finishes, so I unload everything in the morning sometime. One day, I was a little later than usual, and when I opened the dishwasher, I noted that the lights were set as normal, and the door had already been opened. I don’t have an eidetic memory, but I do tend to remember patterns and shapes pretty well, and the dishes inside had been moved. When I asked around, I found out that dirty dishes had been put in with the clean ones. When I queried further, although the dirty bowls, glasses, etc. could easily be identified, the dirty cutlery could not. I ran the load again. Then I asked everyone in the house to please not put dishes into the dishwasher, that I would take care of it. Everyone agreed, and I was happy until I heard the dishwasher stop and went to unload it only to watch the FiL place a dirty glass and bowl into it spilling dirty rinse water over the clean dishes! I loudly asked him what he was doing. “Helping out!” he said with a grin. Amid chagrined agreement, he watched as I set the dishwasher to run again (! ), the same set of dishes getting washed for the third time in two days. I carefully listened for the beeps and as soon as the dishwasher was done, I opened the door to let the steam out and let them cool, then put all the dishes away. Then I went to the outside fridge to get something for dinner and walked back into the kitchen to find FiL putting another glass into the dishwasher! “What did we just talk about?” I exclaimed in exasperation. No one has touched the dishwasher since then. And I’m back on permanent KP duty. But at least I know the dishes are clean and unsullied. You know, this post started out being about how to take care of common cleaning problems. Oh well, maybe next time. One of the challenges that faces Partner/Spouse daily is finding time on the job to actually eat something. When it happens, it has to happen quickly and it has to be filling and nutritious. Taking leftovers is what we normally do for lunch and if there’s no time, it sits in the office fridge until the next day, or else it gets tossed. There’s always a supply of commercial energy bars to keep him going, but there’s no control over ingredients, etc. in those things. The other day, I stumbled across a recipe for muffins that included sweet and savory ingredients. It simplified the process by using pre-made baking mixes (ie, Bisquick, etc.) It also made things “healthier” by eliminating egg yolks. The first mini-batch I made were pretty tasteless. But I liked the idea so I fiddled with it and came up with Quick Breakfast Bites. Mix first five ingredients together until blended. Add last three and stir carefully. 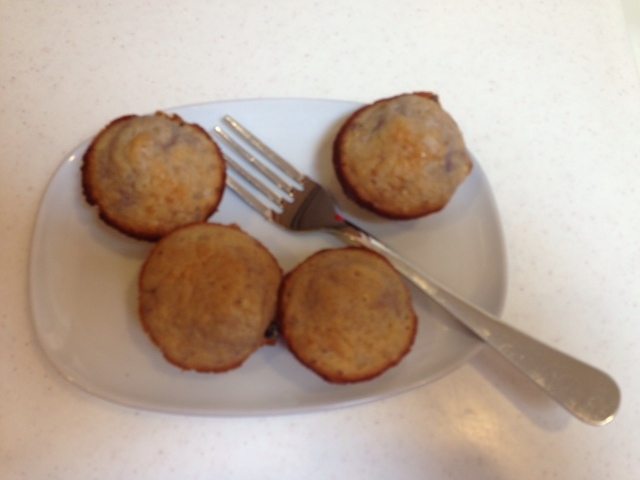 Spoon into mini muffin tins that have been pretreated to even with top. Bake for 18-20 minutes at 375. Cool for five minutes then remove from tin. Can be frozen. Makes 28 mini muffins, or ten – twelve full sized muffins. Enjoy! And let me know how it goes! Something happened last week that was so so good. I went out to the garden kind of early. It’s gotten very hot here. Our daily temps are now ranging near 110, so if I’m going to do anything outside during the day, I really need to do it before 10am or in short bursts. So I was rooting around the tomatoes. It doesn’t show scale, but they’re about three and half feet high, and have spread all over the place. The cherry tomatoes have stayed small, and hidden under the Goliaths. 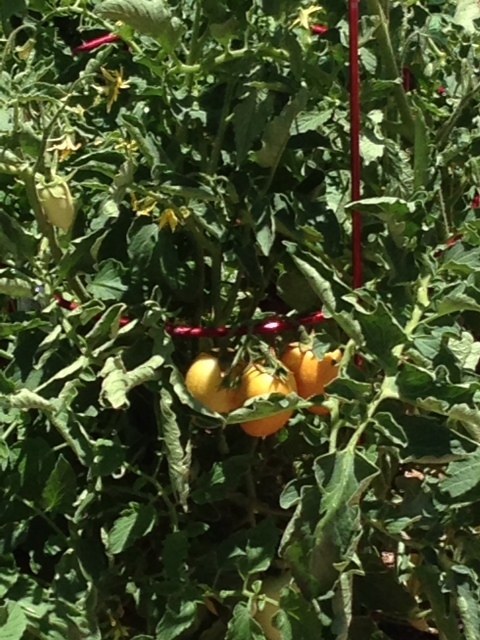 The plum tomatoes are in front where the purple dragonfly is. I’m very happy with the progress. As the plants grew, I watched them very closely. It’s been a long time since I’ve grown tomatoes in the ground, and had a large patch of them. One of the Goliath tomato plants had three tomatoes on it when we got it, and I was hoping they’d ripen up and be good eating. One them actually did, you might recall the post called Why Did This Tomato Split? The other two did something I’ve never seen before. One of them actually rotted from the inside. It was pressing against the tomato cage and I reached down to move it so it could grown properly. It came off in my hand and this icky spoiled green mess came off in my hand and covered it with that smelly goop. Pretty nasty. I tossed it over the back fence into the alley then rinsed off my hand with the hose. I looked at the other tomato and it had started to spoil, so I pulled it off and tossed it, too. I was seriously disappointed cuz as you know, I love tomatoes. 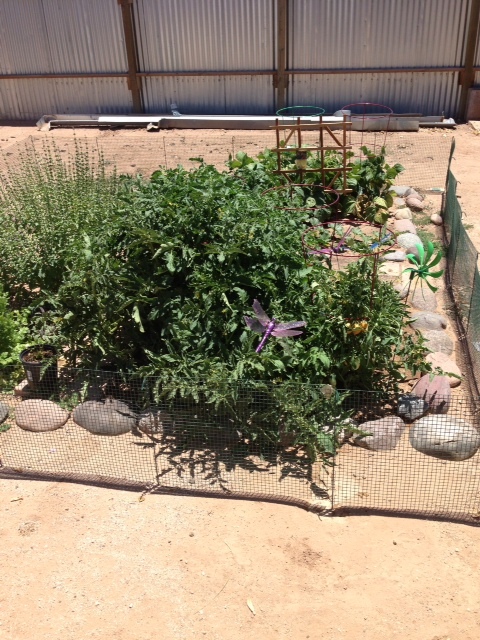 So, Farmer Joe goes along, fertilizing the produce and watering twice a day and feeling a certain amount of pride. Blossoms appeared and little green tomatoes showed up. Slowly they grew and eventually started looking like they were real tomatoes. Funny thing, while that was happening, the other tomatoes were doing the same thing. While I was watching the goliaths, the plums and cherries, even the seedlings, were putting out blossoms and fruit. See the three orange tomatoes there? Those are the first plum tomatoes ripening up, hopefully in time for me to make more salsa fresca this weekend since we’ve got company coming. And if you look around the picture, you’ll see many more blossoms and green tomatoes. But getting back to the neat thing that happened last week. I was looking through the goliaths to make certain there weren’t any more spoiling on me. Tomatoes are notorious for hiding. Since the plant is green, and unripe tomatoes are green, they’re almost as difficult to see as chili peppers are. When I saw a flash of red, I assumed it was the tomato cage I put in to help the plants grow. If you look in the picture of the plum tomatoes above, you can see the red cage. So I kept looking around, and made my way back to where the red was. I took a closer look and there was a full, ripe, red tomato! It had grown on the plant since I put it in, from blossom to green fruit to full ripe! I put my hand out and it almost fell into my palm. It wasn’t huge, but it was large enough to fill my hand. It was perfectly formed, no splits, no green parts even at the stem. It was the photo-perfect tomato. Too bad I didn’t take a photo. I showed FiL and he grinned, almost as proud of it as me. Heat your grill while prepping the food. Heat the grill for at least five minutes, but longer if you can. While the grill is heating, brush extra-virgin olive oil on both sides of the salmon so it has a very light coat. Sprinkle lightly with salt. When the grill it hot, clean it with a scraper, and lightly brush it with olive oil. Place the salmon on the grill with the skin side up. Grill for three or four minutes (I grilled for four minutes per side, but I don’t like sushi.) 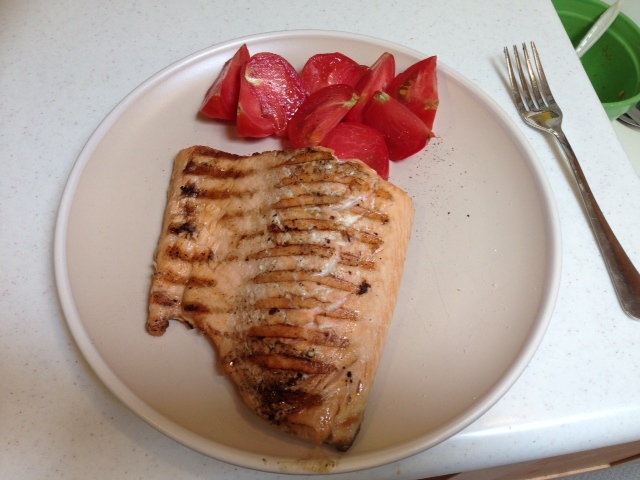 While the salmon is cooking, cut the tomato into bite-sized wedges. When the salmon has cooked on the non-skin side, carefully flip it to the skin side. Grill for three or four minutes. While the salmon is cooking on the skin side, drizzle a scant teaspoon of olive oil over the tomato wedges, and lightly season with salt and pepper. I used fresh ground salt and pepper. Place on the plate. When the salmon is ready, put it on the plate and top with either seasoned butter, or olive oil and salt and pepper. Then eat it. Look at how red that tomato is. It was the perfect lunch and I enjoyed it immensely. Try it some time. Wonderful stuff.